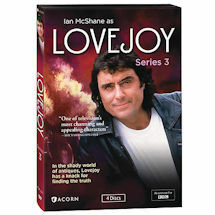 Lovejoy's world faces upheaval-and not just from the risky deals made by Ian McShane's (Deadwood) cunning antiques dealer. 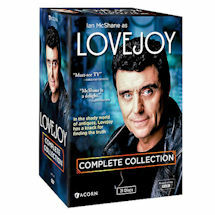 After a change in Lady Jane's (Phyllis Logan, Downton Abbey) circumstances, Lovejoy loses the companionship of one of his most-trusted confidantes. But lovely auctioneer Charlotte Cavendish (Caroline Langrishe, Judge John Deed) soon becomes the (mostly) unyielding object of his affections. Tinker (Dudley Sutton, The Beiderbecke Connection) also takes on an assistant, Beth (Diane Parish, EastEnders), whose youthful exuberance and knack for the trade breathe new life into the team's dicey operation. That's good news for Lovejoy, since he'll need all the help he can get to withstand the challenges that lie ahead-such as impending eviction, an attempt on his life, and a perilous journey to America. 14 episodes on 4 DVDs, approx. 12 hours, SDH.